Fiberglass Tub After Inlay Installed - What a Difference !!!!!!! The topic of Fiberglass Bath tubs falls into 2 categories, Fiberglass tub repair and fiber glass tub refinishing. The vast majority of visits to our web site were in search of repair of cracked fiber glass bath tubs. 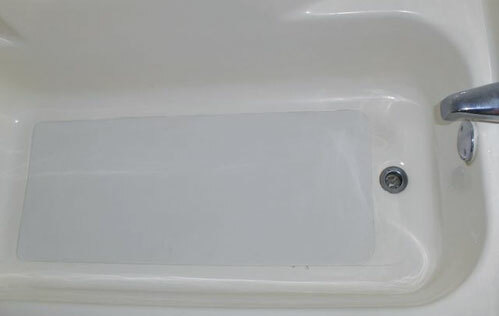 Fiberglass bathtubs generally lack the needed support between the floor and the underside of the bath tub. This being the case, every time you step into the fiberglass bathtub, the bottom of the bathtub flexes just a little bit. Everyone enters the bathtub in the same vicinity in the bathtub. This focuses all the flexing in the same area in the bathtub. Along with the fact that the tub is used every single day by all the persons in the house. This compounds the problem. If you flex or bend anything long enough it will fatigue, and start to crack. This continues, usually undetected, until the crack gets larger, opens up, and eventually a water leak is noticed in the ceiling downstairs under the area where the bath tub is. The fiberglass bath tub can be repaired. There are two methods of repairing. 1st method is where a service company is hired to repair the crack. They come in and repair the cracked area. The warranty only covers that cracked area for a minimal period of time. If a crack opens up in a different area of tub or after the short warranty period, the process is repeated. 2nd method This is the method we follow with GREAT SUCCESS. We make a home visit to measure your fiberglass bath tub. We then have a new custom fiberglass inlay custom made to the exact dimensions of your fiberglass bath tub interior bottom. The inlay is thin enough so you hardly notice that anything is repaired, but strong enough to repair the fiberglass bathtub - period. This method does two things at once. It completely fixes the cracked area in the bathtub and strengthens the entire bottom of the tub. This fiberglass bath tub repair system works so well we offer a 2 year warranty on the entire bottom of the fiberglass bath tub repair. The tub area in the fiberglass bath tub is dull and not shiny, what happened? Most of the fiberglass bathtubs and fiberglass bathtub shower surrounds are dull looking while the top area of the fiberglass surround is still shiny. 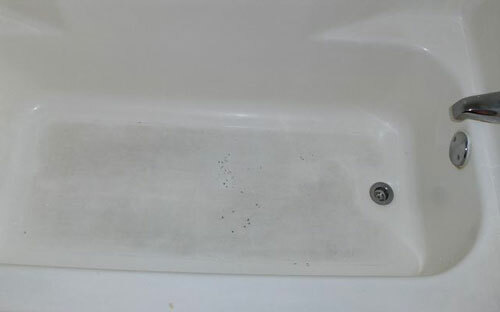 This condition is a result of cleaning the fiberglass bathtub with abrasive cleaners. The use of ajax, comet or green srubbers, scratch the surface just like sandpaper does. These abrasive cleaners will scratch any surface. The fiberglass surface is a very hard resin. Boats are made of this material. It's very hard but will scratch. The good news is that usually the surface can be polished out and made shiny again instead of a total refinishing job. The fiberglass bath tub can also be refinished. 1. Thoroughly clean the bath tub and remove all caulking. 2. Using masking tape, tape all the way around the bath tub. 3. A high-speed ventilation fan is installed and vented outside. This is done to minimize any odors associated with the refinishing process. 4. The over flow cover from inside the bath tub is removed. 5. The entire bathtub is lightly sanded and then vacuumed clean. This is done to create a surface that the primer will adhere to. 6. After sanding the bathtub, the surface is converted to a neutral ph. 7. If there are any chipped or worn areas in the tub we fill and sand them smooth upon the customers request. There is a small additional fee for this. 8. Then drop-cloths are installed on the floor and protective covers are carefully draped over the vanity and toilet. 9. Two coats of a special primer are applied to the surface of the bath tub. 10. Next Twenty-Eight ounces of top coat mixture is applied to the primed surface (3-4 coats). The number of coats required is determined by temperature and humidity. 11. After the equipment is cleaned and put away, then drop cloths and protective coverings are removed. The area is wiped down, paper-work completed. 12. The fiberglass bathtub can be used the following day. There are companies that state that they apply so many coats of primer and several coats of their top coat. I guess they feel they might gain an advertising edge by leading you to believe that more coats are better. When in fact most bath tub refinishing suppliers recommend the same amount of top coat mixture in ounces to be applied to the bath tub in order to extend a 7 year warranty. To keep your bath tub looking great for years to come, do not use any abrasive cleaners. No comet, ajax, green scrubbers, bar tenders friend. A good "rule of thumb" is, If it can hurt your skin, that cleaner should not be used in your house - period. Purchase a cleaner that is designed to gently clean bathtubs and showers. Now that the bathtub has a new shiny surface on it, those spray on cleaners will work just fine. One point here, after you spray the cleaner on the surface, wait at least 5 minutes before you clean and rinse the bath tub. This will allow the cleaner to loosen the soap residue. The use of bleach does not clean a bath tub. It will kill mold, make your white clothes white and wreck everything else. Bleach should not be used to clean a bath tub because it is an oxidizer (bad). Using a wash cloth, wash the inside of the bath tub and rinse out. I recommend cleaning your bath tub like your car. When it's dirty - clean it. The surface is smooth and shiny now and will clean easily with minimal effort.